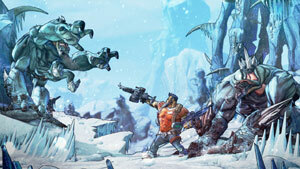 Borderlands 2 is a hybrid First-Person Shooter, RPG game focused on over-the-top co-op play, and set in the open-world game environment of the planet Pandora. 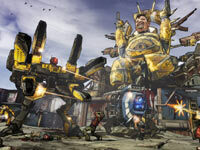 The second game in the game series, Borderlands 2 raises the ‘loot and shoot’ action of the original game with an even larger and more detailed world to explore, an updated gun system, a new cast of characters and character classes, and integration of storyline with action. The over-the-top ‘loot and shoot’ action of the Borderlands game universe returns with a new characters and character classes. 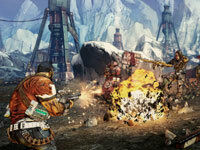 Borderlands 2, sequel to the critically acclaimed and best selling role-playing-shooter hybrid, once again delivers its unique flavor, characters and addictive nonstop collaborative loot-shoot gameplay. 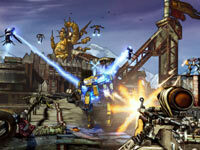 As in the original game, Borderlands 2 features an openworld game environment, but this time around the world players experience is larger and packed with more depth at all levels. The game features an all-new cast of characters, skills, environments, enemies, weapons, and equipment that come together in a carefully crafted and connected story. Make new friends, arm them to the teeth and fight alongside them on a relentless quest for revenge and redemption through the undiscovered and unpredictable living world of Pandora. All-New Characters and Classes – Choose from all new characters and classes including the Gunzerker, who can dual-wield any two weapons in the game. Dual machine guns? Cool. Dual rocket launchers? Of course. Dual sniper rifles? sure, if that’s your thing. Play Online with Friends – Share your adventures with friends both online and via LAN through a seamless system enabling you to drop in and drop out of a campaign without ever having to restart the game. World Connected Story – Left for dead in the frozen tundra of Pandora, begin your quest of revenge and redemption as the story drives you closer to the Hyperion Corporation and its evil founder, handsome Jack. New Badass Gun System – Millions upon millions of possible weapons means tons of new and innovative ways to engage foes on Pandora. Fire, electricity, corrosive acid, and more will all be at your disposal. 87 Bazillion…Everything – It’s not just guns on Pandora, you will lust after procedurally generated shields, grenades, alien artifacts, class mods and much, much more. Brand-new Environments – From the arctic tundra, through the dangerous grasslands, past the mysterious corrosive caverns to beyond, discover more of the unpredictable world of Pandora at every turn. Brand-new Enemies – Hulking, gorilla-like Bullymongs, vicious predatory stalkers and the hyperion mechanical army, run by handsome Jack, are just some of the new enemies you will face. Continued focus on co-op play. 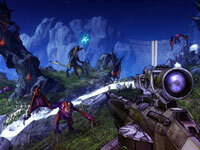 View larger Hybrid FPS and RPG gameplay. View larger New badass gun system. View larger More detailed open-world.